Feline Instincts’ shipping will be delayed for the Thanksgiving and Christmas holidays while we move to Florida. Delayed from November 12th to the 30th. Shipping delayed from December the 23th through January 2nd 2013. Please make sure you are stocked up before the holidays. 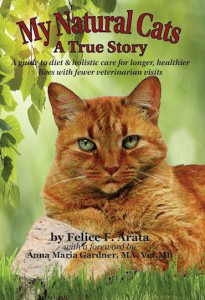 My book “My Natural Cats” is ready for sale – order some before the holidays for a gift. Purchase at www.mynaturalcats.com or www.felineinstincts.com with an order of My Natural Cat premixes.